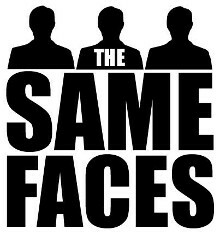 The Same Faces are an improvised comedy group, based in Leicester and Northampton. Founded by Tom, and featuring other regular members Mike "Leo" Brown, Allan Smith, and Dave Gotheridge, the group performs two resident gigs a month (one in Leicester, and one in Northampton). We'll also perform around the UK, including theatre shows, comedy gigs, and corporate entertainment, to name but a few (get in touch via the contact page for booking enquiries). If you've not seen the group before, think Whose Line Is It Anyway?, but live, and without the luxury of retakes. Tom also teaches two weekly workshops (again, one in each town), where potential new players can learn improv, and many develop to the point where they're invited to join us on stage as part of the performance team (find out more on the Workshops page). * Dates at this venue may move occasionally based on the Theatre's diary. Always check our facebook page for latest gig dates. You can find out more about us - and our gigs - on Facebook, Twitter, and Youtube.